Grand Canyon University is a college. A community. A body of believers. A family. Three weeks ago, the GCU family lost a member, one who represented the essence of its competitive spirit. Sophomore Maylinn Smith is grateful for the support of the GCU community in the wake of her father's death on Feb. 4. Randy Smith, 54, the father of Antelope women’s basketball star Maylinn Smith, died unexpectedly in Mesa while the team was in Hawai’i for a four-game trip. When Maylinn became part of the GCU family in 2010, she brought along her own family, a group of supporters led by Randy; her mother, Pam Smith; and three older siblings, Misty Polanco, Josh Smith and Miranda Taylor. Randy, an insurance salesman originally from Oxnard, Calif., was known for his enthusiasm at games and often could be heard offering an alternate opinion on the officiating. However, he always had the same opinion of GCU: He adored the place. “It’s crazy,” Maylinn says. “I think that my dad embraced GCU more than I did. His favorite color was purple once I came here. “It was actually kind of annoying how much he loved GCU,” she adds with a laugh. Randy was so excited about Maylinn attending GCU that he would drive out to campus on his lunch breaks to see the school and observe construction work on the new Arena. He bought season tickets, even though the Smiths had free tickets to each game as the family of a player. Last year, he took both fan bus trips to Pomona, Calif., to watch the women’s team play in the NCAA Division II West Regional. 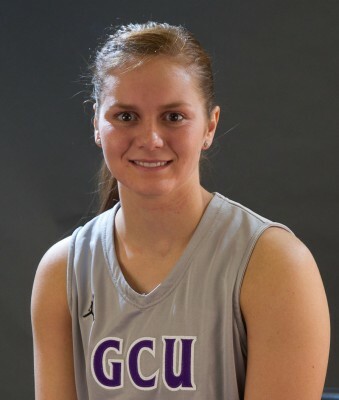 In the semifinals, Maylinn — then only a freshman who came off the bench — scored 23 points in GCU’s 55-35 victory over California State University at Monterey Bay. The game in Hawai’i immediately after his death, against the University of Hawai’i at Hilo, was an emotional one for the Antelopes, who won it in overtime, 65-59, with Maylinn scoring 14 points before fouling out. Since Randy’s passing, Maylinn acknowledges that it has been difficult, but the support of the GCU teams, coaches, fans and community has helped. Maylinn says that her family is grateful for the support of the GCU family. Both Antelope basketball teams attended Randy’s funeral. Others from the University came to the visitation, where Randy’s purple “Pacific West Conference Champions” T-shirt and other GCU memorabilia were prominently displayed. Fans also honored Randy by wearing purple-and-white ribbons at the first home game after his passing, on Feb. 13. “It was really cool to have a chair full of ribbons that night and to see all the fans and coaches wearing them,” Maylinn says. “It was like my dad was there. Words can’t say ‘thank you’ enough for that. “Basketball is just a game, but to know that my dad touched people through the game of basketball means so much more. Cooper Nelson is a GCU junior majoring in communications. A very heart warming story. Condolence Maylinn. It’s difficult to lose someone especially one of your parents. Our condolences to the Smith family from our hearts. We had the honor of meeting, laughing, and talking to Mr. Smith last year. Heaven has another angel.